Through his travel to remote locations and his explorations into the biology, geology, and history of the area, conceptual artist Julian Charrière has made a diverse body of work that investigates the environmental effects of human ascendancy. For this project, he connects the 200th anniversary of the explosion of the Tambora volcano in Indonesia to the current global climate crisis by focusing on the rainforest deforestation caused by the popularity of palm oil and the growth of the industry in the region. 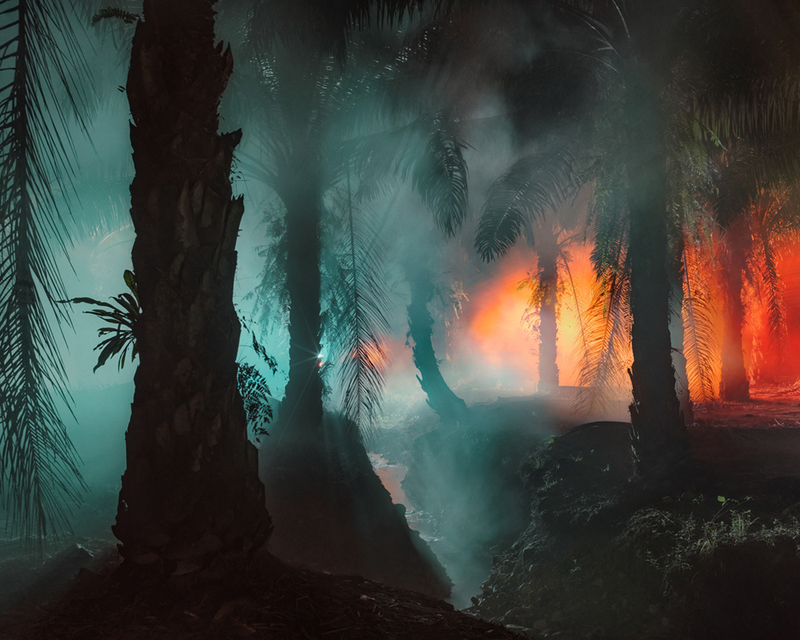 The word tambora translates to “an invitation to disappear,” and the effects of the volcano’s eruption in 1815 were felt throughout the northern hemisphere, referred to as “The Year Without Summer.” Photographing different areas of Indonesia, Charrière aims his camera on the palm tree plantations that have dramatically altered the land, perhaps permanently. Born in Switzerland, Charrière was a student of Olafur Eliasson. He has exhibited his films, photographs, geologically-inspired sculptures, and installations worldwide, including at the Parasol Unit Foundation for Art, London; Musée des Beaux-Arts de Lausanne; Centre Culturel Suisse, Paris; Neue Nationalgalerie, Berlin; The Reykjavik Art Museum; the Museum of Contemporary Art, Tokyo; and the 2017 Venice Biennale.